Toshiba and Toshiba Machine have jointly developed a prototype of a three-dimensional (3D) metal printer that delivers fabrication speeds more than 10 times faster than that of powder bed fusion printers, the most widely used methodology for metal sintering. Toshiba’s new 3D printer uses laser metal deposition (LMD) technology that deposits powdered metal and delivers a laser beam in tandem. The laser heats the powder and sinters it, so that it fuses into a shaped agglomeration. The key to its high speed operation is a new nozzle based on Toshiba’s know-how in fluid simulation technology. 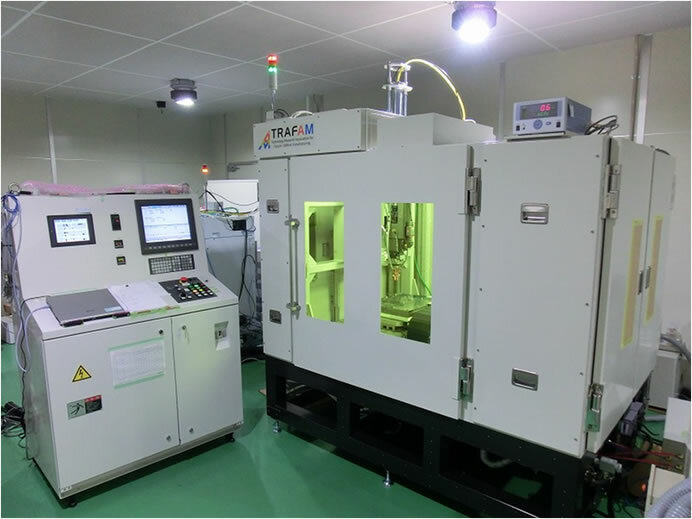 The nozzle reduces the area to which metal particles are injected, and the laser beam focuses very precisely on the tiny area covered by the powder. The prototype achieves a fabrication speed of 110cc an hour with an 800-watt laser output, and can build larger structures at a lower cost than current methods*. The printer works with a wide range of materials, including stainless steel, Inconel and iron. Toshiba Machine will manufacture the LMD 3D printers and market them to customers, along with its computer-controlled machine tools, as a means to create value for customers. The new printer will be showcased at Monozukuri Matching Japan 2015 at Tokyo Big Sight from December 2 to 4.